It's the 5th and final day of the Electric Challenge! Thank you SO MUCH for the nice feedback on the looks I've done throughout the week, and there are now more than 100 #ElectricChallenge pictures on Instagram- how cool! The idea of this challenge is to use the Urban Decay Electric Palette every day for a week, and you have to make sure you work in all of the different shades by the time the 5 days are up! Click here to see all of my Electric Challenge blogs from this week. It's been so much fun to get up each day and map out my eye looks, and I've really enjoyed seeing how these intense shades can transform so easily when you blend them or incorporate other eyeshadows entirely. I think the purple in this palette is one of my favorite shades, so I made that the primary focus of this look, with a blue pop! I think it's a great way to make brown eyes glow! 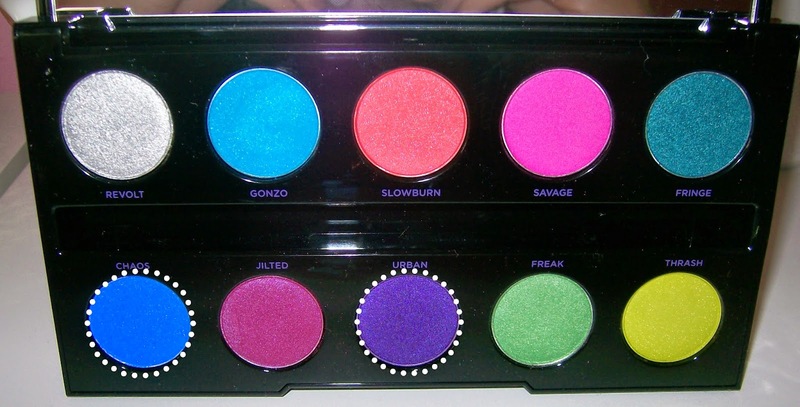 Today's Electric Palette shades are Chaos and Urban. Urban is a stunning metallic purple that takes on different tones depending on whether you apply it very concentrated or sheer. Chaos is an intense royal blue with a satin finish- but in application, it seems pretty matte. In addition to these colors, I worked in some classic neutrals from my Urban Decay Naked Basics palette. That's a very handy thing to use alongside Electric! For my base, I applied a matte white cream shadow stick from Jordana all over the lid and around the inner corner. I dabbed over it with my finger to remove any excess product. Next I added a few neutrals- from the Urban Decay Naked Basics palette, I used Venus (shimmery white) on the lid, Faint (cool matte brown) in the crease, and W.O.S. as my creamy highlight under the brow. I patted Urban on the lid, starting at the outer part and working inward halfway. I went more intense on the outside, and then used a lighter touch so the purple would start to fade into the white. I also blended Urban on the outer part of the crease and just above it. So we end up experiencing 3 tones from just one shade... intense purple (outer corner), lilac (center of lid), and a pinkish purple tone as the color fades up. 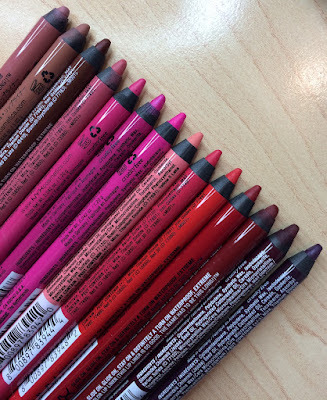 Then I lined my upper lashline with black liquid liner (FYI- I'm using black liquid a lot with these looks because it sets to a matte finish & gives me the intense definition I want with these bright colors! ), and I used a blue liner from NYX on my lower waterline. With an angled liner brush, I applied Chaos along my lower lashline- it's a great match for the blue eyeliner... just get it wedged right in there between all the lashes. Then I used a smudge brush to do a double line with Urban- underneath the blue. I finished the look with mascara on my upper and lower lashes, along with a strip of falsies on the upper lashline. Cupcake was extra adorable while we shot Tyler's review this morning. It's like she knows when she's "on" - LOL! I have done so much brush cleaning this week... gotta start fresh each day when you're using these bright Electric palette shades! I'm trying out a travel hot roller set to review sometime soon... it gave me surprisingly big hair today. Yesterday I saved a frog from the pool vacuum. I think the little guy is gonna make it! You've changed my entire perspective on this palette. I love that you incorporate color into your eye looks quite frequently, even beyond this challenge, because it helps me realize I don't need to be afraid of color. As a matter of fact, I think you did an eye look last year using a WnW LE trio ["A Regular at the Factory from the Pop Art collection] & you made it look so wearable that I actually bought the palette! You've been such a great inspiration & resource the past year while I rediscovered makeup & learned how to use it properly. Thank you! So cute!!! that mini lipstick! Y favorite look so far!! It's hard to believe "urban" can come across SO differently depending on how you use it. Great job Emily! this is so pretty! 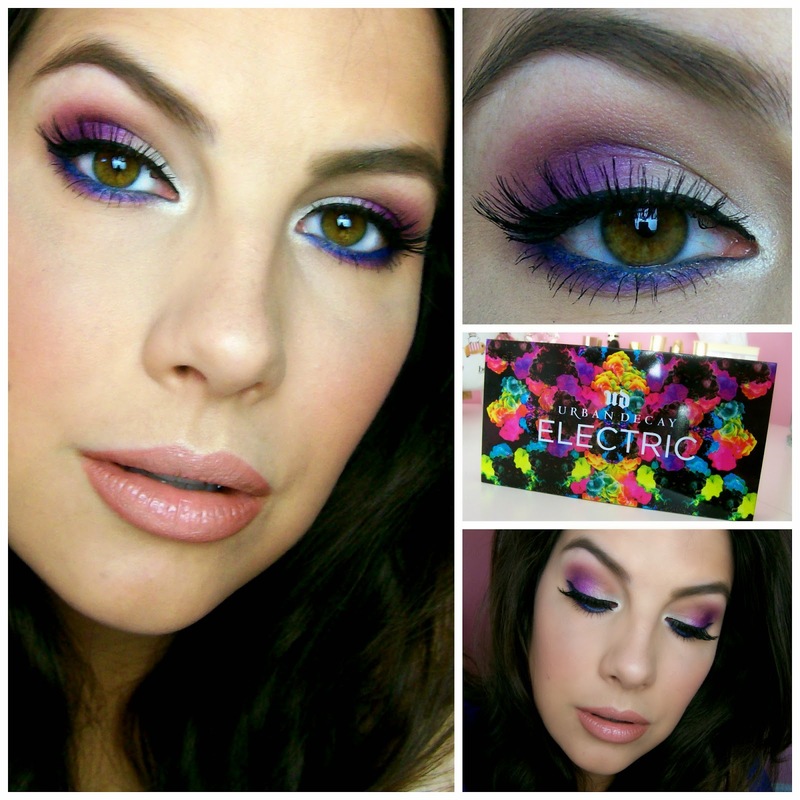 I think this is my fav look that you've done because of that pretty purple that has the brightness form the white! Every day, I swear I am falling more and more in love with this palette - and it is all because of your creativity. Oooh, love this look! So gorgeous. And now I'm feeling inspired to do a 5-day challenge myself... it doesn't seem so intimidating! Thank you! Wow that is a gorgeous look! It doesn't look too difficult either, I'm awful with my eyeshadow so I'll have to try this out and impress everyone (; That lipstick is GORGEOUS! I need it now!! This look suits you so much! I am sad this series is over because I was loving you blogging every day!! Great looks! So creative yet for the most part wearable. Your rocked it! Congrats on getting through the challenge. You and Kristen Gehm did such a great job. This looks soo sassy and I love that you did little step by step pics. I don't know if I'd be confident to rock this, but you look great!! I loved the Electric Challenge idea. I want to try this with other palettes in my collection. Love your looks. From just the few posts I knew your blog was a good one. Some day I've got to get a hold of some urban decay products. Great style. Lovely blog. I'm not sure if my first comment went through so I'm going to repeat myself, lol. Late to the party..as always, but wow you do a FANTASTIC job with your make up. I am older, in my forties and been feeling frumpy. 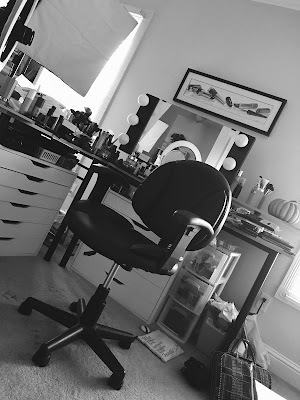 I found your youtube channel and have gotten back into make-up to help myself look better than I have years. I can't believe how easy you make it look!! Congrats on the up coming baby. As a mother of twins and a single I can safely say be ready for your life to change in ways you never expected. I love the makeup >.< so beautiful! Y favorite look mortgage loan companies so far!! It's hard to believe "urban" can come across SO differently depending on how you use it. Great job Emily! Those blushes are absolutely stunning! I really like bella rose. hotels around lake como Too bad we don't really tweede woning costa blanca have Milani in Canada or they're mortgage loan companies usually super expensive.